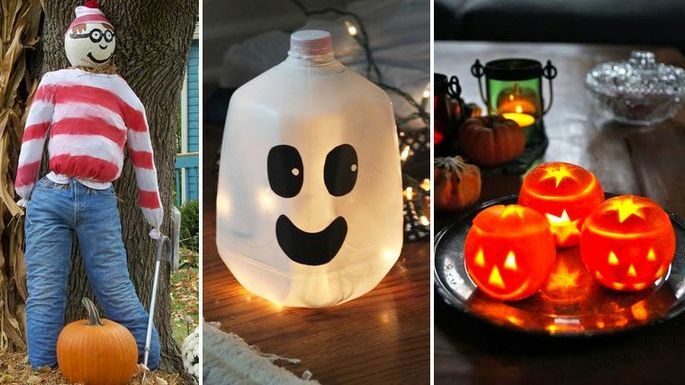 Want some Halloween decorations so you can celebrate this spooky holiday in style—but without the terrifying prospect of draining your wallet? Look no further than this list of easy DIY crafts that are easy to pull together and cost under 10 bucks. Some are even free! 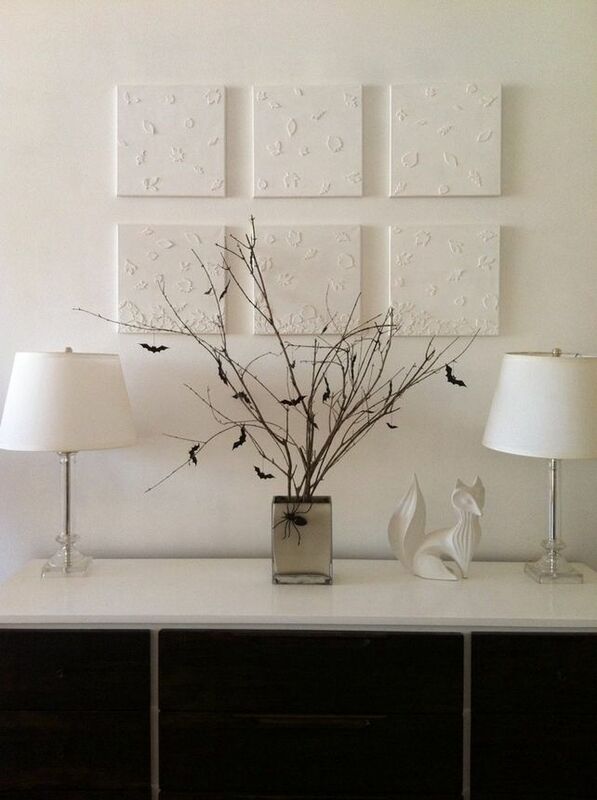 Behold these eight decoration ideas to get your ghost on fast. What's easier than marching into the backyard to clip branches—or gathering a few off the lawn? Plain sticks in a glass vase instantly send out a Halloween vibe on their own. But you can also perk them up with tiny construction paper bats or spider rings secured with fishing line. You could also borrow the candy-in-a-vase idea from Jamie Novak, the organizing pro at BiteSizeLiving. "I'll fill a vase with dollar-store candy corn and then place branches and twigs in the middle," Novak says. A few corn stalks are only a couple of bucks at a farm stand or grocery store. (You might even score some for nothing in an abandoned field.) 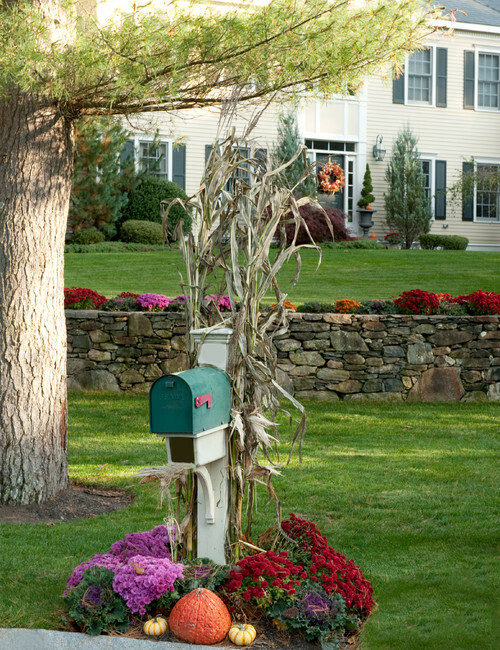 Try tying them to your mailbox, on the front fence, around a lamppost, or on the columns that flank your front door. This Halloween look is made even better with the addition of a few mums (often three for $10 at home and garden centers). Check your Goodwill-bound bags of clothes for a pair of pants and a shirt and then rake up a pile of leaves, suggests Cynthia O'Connor O'Hara, aka The Harried Housewife. "Stuff the arms and legs with leaves and then tie them closed with twine," she says. Pin the shirt to the pants, use a Halloween mask or old ball for the head, and then prop him under a tree or covered porch. You can also fit the legs into an old pair of boots to stand him up. For another filling idea: Grab those pool noodles before putting them away for winter, says Julie Coraccio, the home organization pro at ReawakenYourBrilliance. "Thread the noodles into jeans and a shirt or make a ghost by twisting them in circles for a head and body and throwing a sheet over it." Think white, not orange, for this idea. 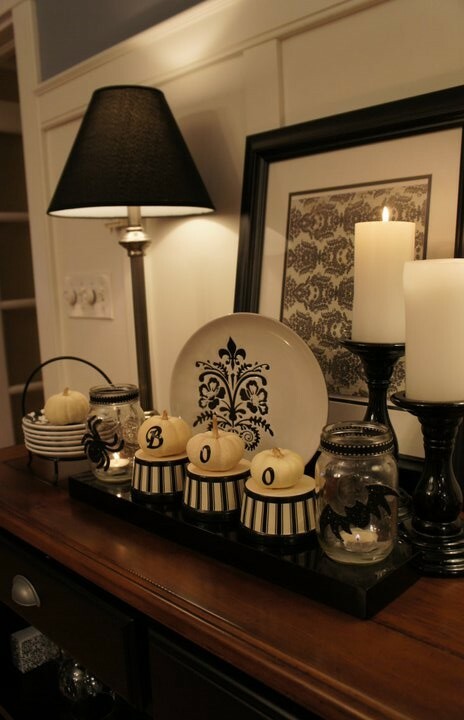 Make a black marker design on white gourds or small pumpkins. Or glam them up with sparkly glue, says O'Hara. "Thin out regular glue with a little water and paint it on any squash that's on sale," she explains. Cover the glue with colored glitter (orange, gold, silver, or black). Cheesecloth and gauze are kitchen/drugstore staples that can be wrapped around a container to look like a mummy or ghost. 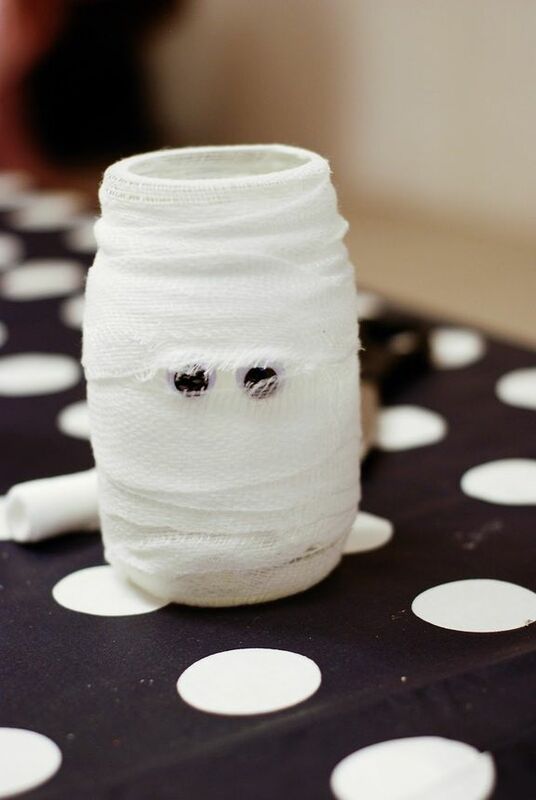 Grab an empty peanut butter or spaghetti sauce jar, wrap it with gauze, tape up the back, and then glue on googly eyes. "You can also turn a cardboard berry box upside down, place a Styrofoam ball from the dollar store on top and then drape it with a piece of cheesecloth or section of an old sheet," says O'Hara. "Then draw on a face with black marker." Have a few empty toilet paper or paper towel tubes? 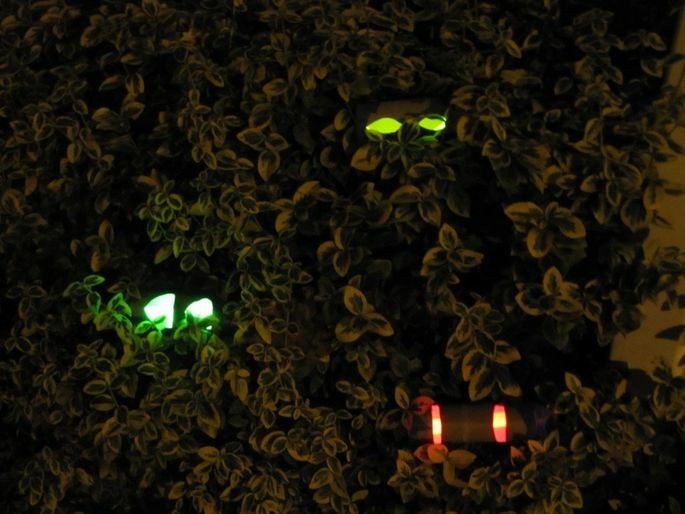 Add colorful glow sticks, and your bushes will suddenly turn creepy. "Cut eyeholes on the side, tape a glow stick inside, and then place or tie them into your bushes," explains Novak. 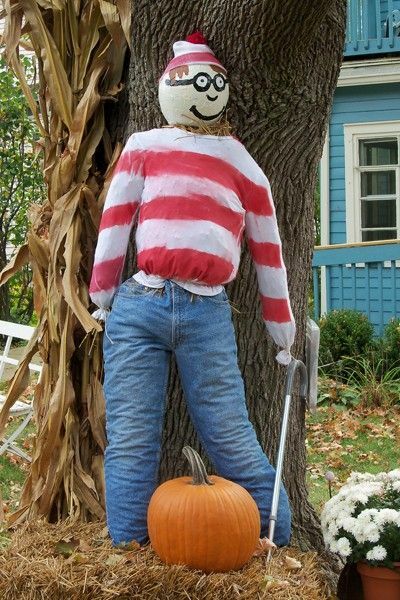 For added spookiness, you can drape white yarn or cotton batting on the hedges and trees to look like spider webs. Pumpkins are in season now, but sometimes the price of this Halloween staple can make you gasp. Instead of paying through the nose for a pumpkin, grab a bag of navel oranges for half that amount. Making jack-o'-lanterns with this fruit is less messy, much cheaper, and far easier than using big, tough pumpkins. 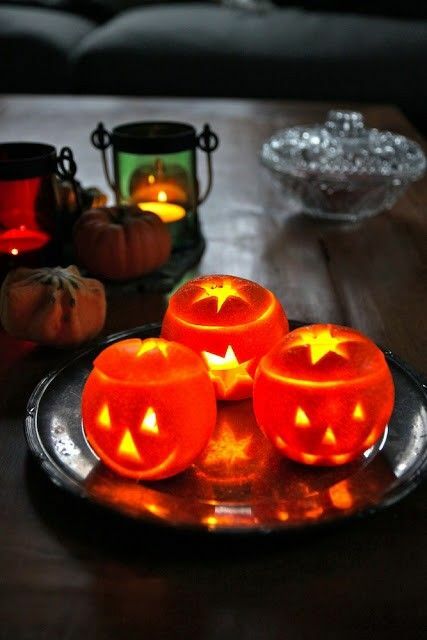 Pop a votive candle inside each, and arrange them on a windowsill. 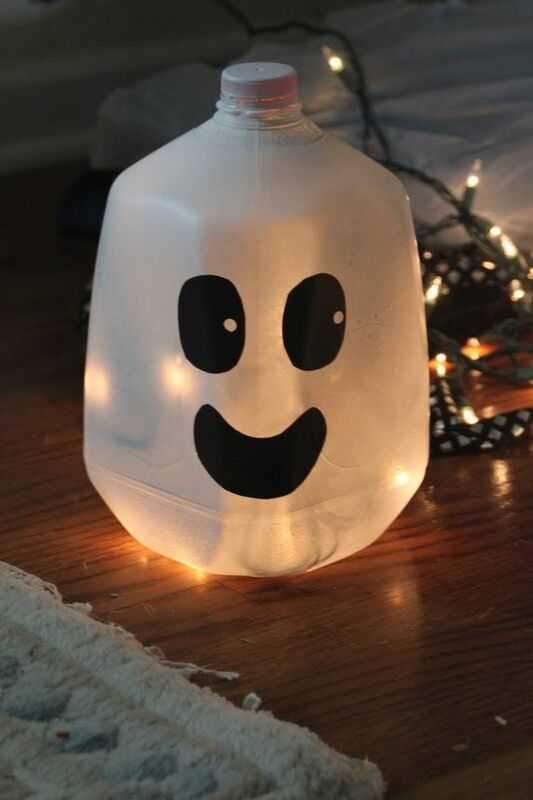 A gallon-size plastic milk jug can also serve as a great stand-in for your typical pumpkin, says Novak. Just use a permanent marker (or cutouts of black paper) to make a face, and fill with a candle or a strand of battery-powered twinkle lights.